You are currently browsing the daily archive for March 6, 2013. 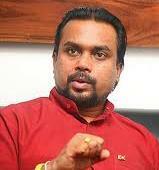 Why Mr Weerawansa is again on the rampage about me I have no idea. Therein perhaps lies the rub. I believe I have done more since Kannangara for introducing equity in education, but this has been largely with regard to English. While the pre-University General English Language Training programme was started by someone else, I was involved from the start, in producing readers for the course that students responded to with ease. After I took on the course, along with the best instructor in the University English Units in those days, we transformed the course, and produced text books that were later prescribed for Indian universities – though perhaps that too would be anathema to Mr Weerawansa. Together with that, I was responsible for English courses at the Affiliated University Colleges, initially the diploma course but then, at the request of the UGC, General courses which were mandatory at all Affiliated Colleges. At Jayewardenepura, whilst coordinating AUC English, I started courses which gave English degrees to students who had not done Advanced Level English. I also started an External Degree, with two and then later three subjects related to the learning and teaching of English. This is now the most popular degree course in the whole University system.